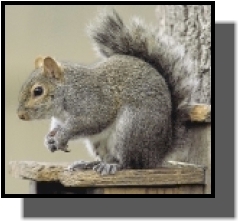 Comments: Eastern gray squirrels have long, bushy tails with whitish fringe and gray fur. They search for food during the day and use their front feet to eat while sitting on their hindquarters. Communications include scolding barks, teeth clicks and tail flicks. Throughout the day they are seen jumping from tree to tree or resting on limbs with their legs dangling down. Females bear litters of 3-6 young in early spring and late summer. They may live as long as 12 years. As woodland cover increases in eastern Kansas, gray squirrels displace fox squirrels. Distribution: Gray squirrels range throughout the eastern half of the United States and southeast and south-central Canada. They are found in oak-hickory forests in the eastern quarter of Kansas. Food: Gray squirrels feed on nuts, seeds, berries, buds, insects and occasionally on bird eggs and nestlings.